Day of rest. Went to church. We had a Primary program - the children sang. Everybody except for Benjamin and Stephen participated from our family. Jenny and Julia sang as duet "I feel my Savior's Love". Then we had a lesson on Helaman 6-10 in the Book of Mormon. I really like the verse at the end of chapter 9 when the converted unbelievers are impressed by the power of Nephi because "he has told us things". Then we had a lesson in the Elder's Quorum on faith from the teachings of George Albert Smith manual. Some people find it boring to be taught from the manual, and some teachers even find it boring to teach from the manual and attempt to "spice up" the lesson by teaching their own thing instead. I recognize that this may be the case for some manuals written with little thought or foresight. But the ones we have in the Church have been received by revelation. On many occasions I have found that the issue I am struggling with can be solved by applying a principle that I just read in the manual that morning. I can testify that those manuals have answers for all of our problems. Yes, all. It takes faith to extract them, without faith the manual appears like a bunch of tedious text that you think you've heard before, for some difficult questions you may lack the faith to extract the answer, but amazing things happen when you begin to read those manuals with faith. Indeed, like they say on some technology forums, Read The Fine Manual, or at least that is how a good Latter-Day Saint interprets RTFM. A.M. Our kids have been afflicted with injuries. Nothing super serious, but keeps them from running at 100%. But at least they can still run. Benjamin had a cold and he also sprained his wrist playing tag. Jenny's bones are growing faster than the Achilles tendons, so that makes her ankles hurt. Julia's stomach was giving her problems. Only Joseph, Jacob, and William were healthy today among the runners. Even Sarah had contractions and had to stop a few times during her run. And, fortunately, I am still healthy. Better be healthy, the marathon is coming up. Just knowing that you could catch a cold right before the marathon is a great teacher of humility. Three months of work can go down the toilet from one accidental exposure to an infection your body fails to find a good response to. That is why Paula Radcliffe once surprised a reporter when he asked her for tips on how to prepare for a marathon - she said: "Wash your hands!" But you can wash them only so much. There are more infections out there than you can possibly kill. The day is 86400 seconds long. In one of those seconds, the infection comes, and you miss it. You can do a multitude of things to keep yourself from getting sick, but you need to realize that ultimately you are at the Lord's mercy. So you get a lesson in faith and humility. I decided to never take for granted the ability to show up healthy at the start of a race. That moment, before the gun goes off, a prayer of thanks is in order. So today I ran 12. Benjamin did 3, Jenny and Julia 3, Joseph 2, and Jacob 1. A.M. Ran with the kids. 3 with Jenny. 2 with Joseph. 1 with Jacob. The rest myself. Carried weights for 2 miles. Did a pickup for 1.5 in 8:07, and then one more for 0.5 at the end. Total of 10. Benjamin did 3. P.M. Benjamin, Joseph, Jacob, and Julia ran in the 3 K cross country race at the Kiwani's Park. Benjamin was still having problems from the cold, and his wrist was still hurting. So I told him to just go out with the leader, if he felt the pace was way too slow, just go ahead, but otherwise sit and wait for the kick. With how he was feeling, I was not sure he'd be able to do even that, and neither was Benjamin, but I told him to try his faith. If it was the Lord's will for him to win, he would, but he would not know unless he was willing to give the Lord a chance. He did as he was instructed. His competition was Garth Gardner - they dropped everybody else almost immediately. With 600 to go Benjamin was able to shift gears and win with 10:54. Garth got 11:04. Joseph won the sub-Bantam division in 14:12. Jacob was third with 15:36. Julia was a bit hesitant to run hard because of a stomach ache, so I told her to just go and run with Jacob. She did, and finished in 15:37 in 4th place in the Bantam Girls - it was only 22 seconds slower than the winning time. I told her next time just to go hard and win the Bantam Girls. Also, to try to not get beat by Joseph. A.M. Ran with the kids. 3 with Jenny and Julia, 2 with Joseph, 1 with Jacob, 2 more with Julia on a bike. Benjamin did 5. I did a pickup for 0.5 uphill in 2:40. Carried weights with me for 3 miles. A.M. Total of 8. Jenny did 3, Julia, Joseph, and Jacob 2. Benjamin did 7.5 including 0.5 with William. A.M. Total of 6, some with the kids. Did a pickup for 0.5 in 2:40 uphill. Joseph did 2, Jacob 1, Jenny and Julia 3. William 0.5. Benjamin 7.5. P.M. Travel to Logan with the family. Stopped at Brigham City, went to the Temple Open House. Stayed with Steve Anderson. A.M. Top of Utah Marathon, 2:34:48, 5th place, $250. Our family stayed at Steve's house. It was very nice as he had room for all of us, and there are many of us now, more exactly 9.6. Steve and I drove together to the bus, then rode it to the start. At the start I had several visits to the city of Oz (secret bathroom available only to runners that would think of a warm-up before the marathon), but that later proved inadequate. There was enough trouble at the start for me to be wearing bib #10. I figured that was OK, I did not have to finish above 10th, so no pressure. I came with the goal to run 2:29:59. That did not happen, but at least I had a respectable race, and I got some ideas on what went well in my preparation, and what needed to be fixed. And I got $250 so that is a plus. Not as big of a deal as it used to be. As the years went by my job pay has progressed, and my runners pay has digressed. The digression is due to two main reason - the competition is tougher, and I have been running slower. Not that much slower - my time today still would have won had I run it in 2003 or 2004. But runners in Utah have gotten faster. So today it was only good for 5th, which is OK. I do have an interest in people getting faster, enough that I maintain the Fast Running Blog. So it is good that they are actually getting faster. All in all, even if I could have won with the course record, I would still not be as excited about the pay as I used to be as far as the amount is concerned. However, cash represents my ability to stick my head into the fray, compete against runners who usually have a normal spine and come back not empty handed. So in that sense I still value winning cash. A race that offers just a big trophy brings a lion that has eaten, but a race that offers cash brings a multitude of lions that have not. 1 - 5:30 - Jake, Jon Kotter, Jason Holt, and Steve Shepherd went ahead. I was with Jimmy Grant, Albert, and Devin Lang. I guessed by the effort 5:21. At least that is what it would have had to be for me to run under 2:30. When I saw 5:30 I was not happy, but I still had hopes that maybe it was just warm-up sluggishness. 2 - 5:37 (11:07) - I knew at this point that 5:30 earlier was not warm-up sluggishness and that barring a miracle 2:30 was not happening today. In the past I would not have known that, which perhaps would have made it a more interesting race. But I knew at this point that I was headed for something in the 2:34-2:36 range, maybe if things went really well in the second half 2:32 high, but not 2:30 or under. In that sense, the races have become more challenging for me. I have enough experience to know early what time I am headed for. But I still have 24 or slightly less miles to go. So there is 20+ miles of work ahead when I already know what time I am going to get. I know where it is going to hurt and how bad. I know the pain, and I know the result, and I still have to do it. This is a challenge for me to have the faith to take the result - not the result I want, but what the natural laws have given me - and be thankful for it. 3 - 5:35 (16:42) - No surprises, the pack is still together. 4 - 5:37 (22:19) - Again no surprises. I think somewhere around here Albert dropped back. 5 - 5:33 (27:52) - Devin and Grant turned up the heat a little and I started feeling it. No surprise, I was expecting to feel the heat at 5:33 based on the earlier miles. Also, no surprise that they would try to rev it up a little. They told me earlier they wanted to run under 2:30, and I told them that they needed to hit the half in 1:12, 1:13 low at the slowest unless they trusted their ability to run a huge negative split. On this course, even split is in effect a huge negative split. 6 - 5:38 (33:30) - Shortly before the end of this mile I took my foot off the gas and dropped back. 5:33 felt out of range, and I know how punishing it gets after mile 18 on this course. You do need to bank some time in the early miles for the fallout, but you need to do it with an effort that is less than what I have been putting in in the last two miles. 7 - 5:46 (39:16) - At least it is 5:46, not too bad for running alone and recovering from an earlier surge. This is a lonely moment. It is not fun to get dropped. That is one reason I hang on when people go out of my range for some time in hopes that maybe they will slow down or I will get used to it. I really do not like to run alone. 8 - 5:44 (45:00) - Glen Tucker (The Little Bad Legs) caught up to me and we started running together. That was very nice. 9 - 10 - 11:10 (56:10) - Working together with Glen. 11 - 5:37 - (1:02:47) - Working together with Glen, actually more like me sitting on him. 12 - 13 - 11:45 (1:13:32) - The ball got dropped here. Part of the problem is that I stopped for a VPB. But it was very fast, only 5 seconds. Probably a bigger part was that Glen started getting a cramp and slowed down. I was happy to rest after a post VPB surge to catch up. Too happy. I eventually realized I needed to move on, but it was too late as we lost a lot of time. Half - 1:14:09 - manageable, and not feeling terrible. But we have another half marathon left, and a lot can happen. 14 - 5:38 (1:19:10) - Hoped it would be faster with the tailwind carrying me, but it was not. 15 - 5:53 (1:25:03) - Cause for concern. It should have been faster. But at least it is still under 6:00, and I have had years when that mile was over 6:00. Glen recovered from his cramp temporarily and caught up. Following him. 16 - 5:57 (1:31:00) - concern reduced, but not gone. Still running with Glen. 17 - 5:57 (1:36:57) - concern reduced, but still present. Still running with Glen. 18 - 5:54 (1:42:51) - Glen heard the spectators cheer and surged. I sensed that he surged too hard, it was not good for me to go with him, and also that he would come back. So I responded only in part. But I could respond. If I am responding to surges at 18, it means I have some hope. Towards the end of this mile Glen ran out of juice and I passed him. From that point on to mile 23 I ran alone. 19 - 6:12 (1:49:03) - The first installment of the Providence Heartbreak Hill. To my surprise I am feeling strong. Starting to hope for maybe 2:33 high, or even 2:33 low, or even under 2:33. I can be optimistic. 20 - 6:12 (1:55:15) - The second installment of the Providence Heartbreak Hill. So far so good. 21 - 6:03 (2:01:18) - This mile was eventful. It goes downhill. A good split on it is around 5:45 for me. Half way through it I saw Steve Shepherd calling on a cell phone apparently for a ride. So that puts me in 6th place. One more pass or DNF, and I am in the money. The good old hunt for a ram to sacrifice begins. I've done it so many times. A few times I was the ram as well, the most notable being Ogden 2005 when Paul ended up playing the role of Abraham with a knife. In spite of the ram hunting position advance to cheer me on, I am starting to feel a bit like a ram myself. That strength I had just a mile earlier is gone. Thus 6:03 instead of 5:55. 22 - 6:24 (2:07:42) - One tough mile. Has a small climb and a lot of turns. Very difficult psychologically. In the past races I often thought during that mile why I even bother running TOU or any marathon. I knew I would have these thoughts, so I prepared for it. Just told myself no matter what, even it is slower than 7:00, just keep plodding along. Come come, ye saints, no toil no labor fear. It was actually not too terrible. 23 - 6:28 (2:14:10) - Last mile before Benjamin came to the rescue. He started running with me at the 23 mile marker. I was looking forward to seeing him. This mile is also difficult - very similar to 22, but it is 23, so it is easier mentally a bit because you are closer to the finish. 24 - 6:26 (2:20:36) - During the mile as Benjamin cheered me on I moved into 5th place after passing Devin. It was his first marathon. 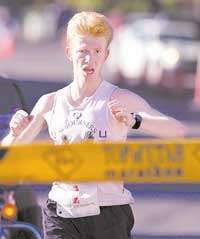 He is a Utah State runner used to running shorter distances and he is just about to go on a mission. So either barely or almost 19 years old. Marathons are merciless beasts. 25 - 6:29 (2:27:05) - We see Jason Holt ahead, and Benjamin is just going wild. He wants me to catch him. I've trained a 13-year-old monster. He is completely conversational at sub-6:30 pace on rolling hills at 4200 feet altitude. And he is now remembering all the things I've done to him to make him go faster, and he is doing them to me to the best of his memory. He is remembering them in the most annoying way. Keeps telling me to give him five when I am still in contact. Keeps telling me to run faster every 5 seconds. But I am thankful to have my son with me at the end of a marathon. It is a very special moment for me and it is a learning experience for him. He is watching the wall, he is learning about the tough realities of "the zone". 26 - 6:25 (2:33:30) - Closing the gap on Jason but not fast enough. With each step we are closer to the finish, and in proportion to the decrease of the distance, Benjamin keeps getting more and more urgent in his pleas for me to go faster. But I do not have another gear. I've felt this feeling before. I could not understand it. It did not feel like fuel. Legs do not feel weak, the mind is still there. But when you try to run faster you feel like you are not able to use the air that you are trying to breathe in. The heart does not want to respond. On the HRM you would see a relatively low HR - for me something like 145-147 instead of 154. I used to think it was the loss of the neural drive. But after pondering the experience from today and other marathons, I am beginning to wonder if this is just the heart itself being tired. It is not deathly tired - it can still pump enough for you to go 6:20-6:30, but it is too tired for anything faster. The last 385 yards - 1:18 (2:34:48). Jacob, Joseph, Julia, and Jenny joined me at this point starting a little bit ahead just in case. Sarah tried to join us with a stroller with William and Stephen, but she started too late and when the announcer said something about only runners being on the course she got shy and did not go through the finish line. I told her next time to never mind the announcer and if anybody says anything tell them she is my wife. My official time was 2:34:43, but I am quite sure it is wrong. There was a mat for the 5 K that I crossed about 5 seconds before I crossed the finish line with the clock which also had a mat. My watch said 2:34:48, there is a picture of me approaching the finish line as the clock says 2:34:46. Not too big of a deal, but when it comes down to time, I like to keep the record straight. Jake won with the official 2:22:12, then Jimmy Grant 2:29:35, Jon Kotter 2:31:05, Jason Holt (not Dave's brother) 2:34:26. In 6th place Joe Furse 2:39:37, then Devin Lang 2:40:06. P.M. Kids did their own runs. Benjamin did 7, Jenny 3, Julia and Joseph 2, Jacob 1, William 0.5. Sarah and I went to the adult session of the stake conference. The talks were good. I liked the one about the room in the inn which was in reference to the birth of Christ, and the inn keepers saying to Mary and Joseph that there was no room in the inn. How easy it is to fill your schedule with stuff and/or your budget with expenses and leave no room for Christ, or in other words, the things that He would have you do. So when an opportunity arises to do something good that is rather inconvenient and requires some stretching, yet deep down you know it is the course the Lord would have you take, a good question to ask is if there is room in the inn today.